Since the decision was made, I’ve been to apprehensive to post about this – but I think it’s safe to now! Lottie’s Lot will be moving to South Hobart! I’ve wanted to leave this house behind for years, but I didn’t think my husband would ever leave. Ever. I’m a little sad to leave a garden just getting on its feet. The berries are finally well established. The asparagus and broccoli are yummy. The raised garden beds are fantastic. So I have to admit I shed a few tears one afternoon out in the garden, but I am looking forward to the new house. We are hoping the new house is our forever house. The garden was loved, and by someone who was interested in fruit and veggies. The garden isn’t as big as our current one, but it does have some fruit trees and a veggie plot. This morning the real estate agent told me the vendor would be happy to show me around and let me know what plants are where, so of course I said I would definitely like that! 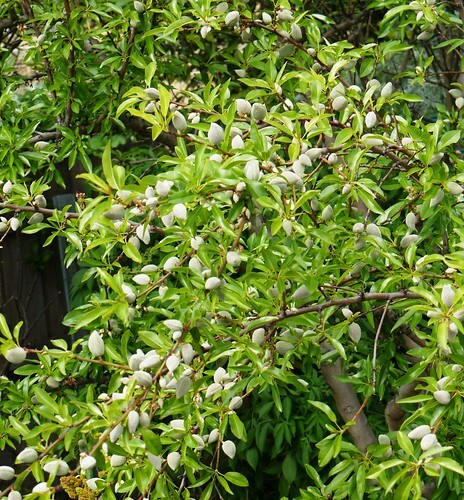 I know there is an almond tree in the back, espaliated fruit trees in the front garden, including a cherry. I saw potatoes growing in the veggie patch and various berries. So I want to find out what is there, then think about what I want. Maybe more raised garden beds. Maybe (definitely) some articokes. Raspberries (if there aren’t some already). More herbs. I’ll move the tree we have in wine barrels to the new patio. It’s rather exciting! This entry was posted in New garden in South Hobart. Bookmark the permalink.